The University of Leicester is a major research led university based in Leicester, England, with approximately eighteen thousand registered students - about ten thousand of them full-time students, and six thousand of them distance-learning students. 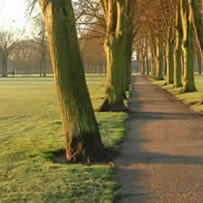 The main campus is about a mile from the city centre, adjacent to Victoria Park and Wyggeston and Queen Elizabeth I College. 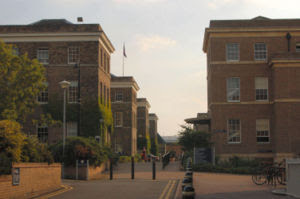 The University was founded as Leicestershire and Rutland College in 1918. The site for the University was donated by a local textile manufacturer, Thomas Fielding Johnson, in order to create a living memorial for those who lost their lives in World War I. This is reflected in the University's motto Ut Vitam Habeant — 'so that they may have life'. The central building, now known as the Fielding Johnson building and housing the University's administration offices and Faculty of Law, dates from 1837 and was formerly the Leicestershire and Rutland Lunatic Asylum. Students were first admitted to the college in 1921. In 1927, after it became University College, Leicester, students sat the examinations for external degrees of the University of London. In 1957 the college was granted its Royal Charter, and has since then had the status of a University with the right to award its own degrees. The University won the first ever series of University Challenge, in 1963. Two names commonly associated with the University of Leicester are Richard and David Attenborough. Their father Frederick Attenborough was Principal of the University College from 1932 until 1951. The brothers grew up on the campus (with their younger brother John), in a house which is currently home to the careers service (and is now near to the Attenborough tower, the tallest building on the campus and home to many of the arts and humanities departments). They were educated at the adjacent grammar school before attending the Royal Academy of Dramatic Art and the University of Cambridge respectively. Both have maintained links with the university - David Attenborough was made an honorary Doctor of Letters in 1970 and opened the Attenborough Arboretum in Knighton in 1997. In the same year, the Richard Attenborough Centre for Disability and the Arts was opened by Diana, Princess of Wales. Both brothers were made Distinguished Honorary Fellows of the University at the 13 July 2006 afternoon degree ceremony. The University of Leicester is one of the older universities in the country. Founded in 1921 with nine students, the fledgling college gained full degree-awarding powers in 1957 when it was granted its Royal Charter. The site for the University was given by a local textile manufacturer, Thomas Fielding Johnson, in order to create a living memorial for those who gave their lives in the First World War. This is reflected in the University motto 'Ut Vitam Habeant' - so that they may have life. Famous names associated with the University include: Lord Richard and Sir David Attenborough; poet Philip Larkin; authors C.P. Snow, Malcolm Bradbury and Sue Townsend; astronaut Jeff Hoffman; astronomers Patrick Moore and Heather Couper; TV personalities Michael Nicholson and Sue Cook; the Commissioner of the Metropolitan Police, Sir John Stevens; the Government's Chief Medical Officer, Professor Liam Donaldson and comic Bob Mortimer. Good post. I studied for my MSc in Leicester university. Very good experience. Recommend warmly.